Within 24 hours, three states in the Hindi heartland have changed their political colour from saffron to blue. Is this a vote against the BJP? Or is this a vote for the Congress? The BJP was clearly routed out in Chhattisgarh. But to interpret it either way in Madhya Pradesh and Rajasthan is too extreme. Voters didn’t award the Congress or put away the BJP as expected in Rajasthan and in Madhya Pradesh, the fight was so close that no one could predict who would form the government until the very end. 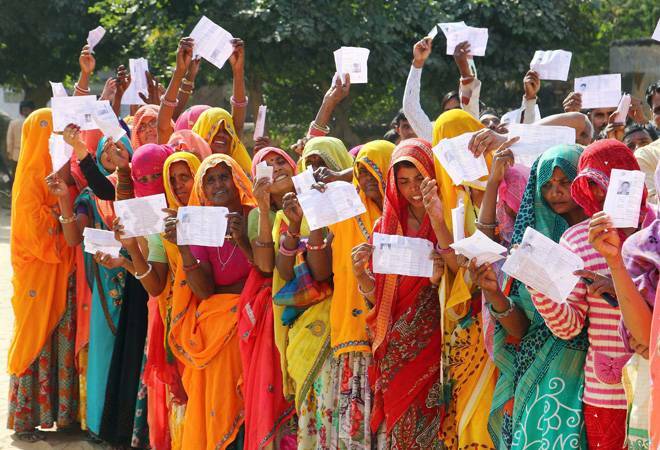 In Rajasthan, the dissatisfaction with the Vasundhara Raje government was thick in the air and for the past 25 years, the state has never re-elected the incumbent. There was also a perception of Raje as arrogant and a visible strain in the relationship between her and Amit Shah. In addition to this, the ability to connect with farmers and the youth over farm distress, unemployment and the anger over SC/ST act dilution by the BJP favoured the Congress. A few months ago, one would’ve assumed that Rajasthan would be an easy win for the grand old party, had the part kept up its initial spirit in the state. It could have easily won 115 seats and also reduced the BJP to less than 40 seats instead of scraping through to the majority. The party managed to win only 101 seats with an ally. The game changed in the eleventh hour when the infighting between Pilot and Gehlot was clearly palpable and Raje carefully played her cards while selecting candidates in a state where caste politics takes centre stage. What might have also helped increase the final tally of the BJP is the apparent affinity of voters towards Modi at the centre. Finally, the BJP managed to win 73 seats and garner a vote share that is just 0.5 per cent short of the Congress’. The people in Rajasthan want a change in the state leadership but they are far from ruling out the BJP as a possibility for 2019. So, while the Congress in Rajasthan can take a moment to celebrate, it shouldn’t make the mistake of taking it easy during the general elections, because the ultimate battle will take a different form altogether. Vasundhara Raje, on the other hand, should look back and learn from the innumerable mistakes she has made in the past five years and help the BJP construct a strong and sensible manifesto for the general elections. In Madhya Pradesh, BJP managed to win 109 seats, just 5 seats short of the Congress and attain a vote share that is 0.1 per cent more than the Congress. Clearly, the voters are not happy with the BJP’s performance but the party continues to be the choice for more people. Under the BJP’s rule, the state festered with problems, like farmer distress, unemployment and corruption. Adding to this is the fact that the BJP had been in power for three terms. So, the work for the Congress had been done before it started its campaign for 2018. The party needed to stop the infighting which often leads to electoral defeat. This time around there was an initial difficulty in bringing together Digvijay Singh and Jyotiraditya Scindia, but Kamal Nath managed to pull the party together in the end. They also managed to tap into the dissent of the farmers by promising loan waivers and a cut in power bills by 50 per cent. The party adopted a new tactic to counter the Hindutva ideology of the BJP by projecting an image of ‘soft Hindutva’. Despite all this, the Congress couldn’t reach the majority mark. Even though the Congress emerged as the single largest party, its failure to reach the majority mark and the BJP’s final tally should keep it on its toes for the upcoming election in 2019. The BJP’s usual approach to elections by focusing on Hindutva, Ram Mandir and attacking the Congress has failed to have the effect it usually has. The saffron party needs to focus more on issues that affect people’s daily lives. Moreover, it has to understand that four years ago, it was on the offence but now it is on the defence. The party needs to adopt this stance and know that after a term in office, it has questions to answer for, and any hopes of getting itself re-elected will only come by proving itself worthy of the vote of the masses. The assembly election results are a warning from the people that the party at the centre today needs to walk the talk and change the aforementioned rhetoric. The Congress seems to have learnt something from its previous mistakes. It has sincerely attempted to create a connection with the masses this time. But the party needs to use this chance to prove itself and be aware that its performance will be closely monitored by the people. Very informative and interesting post. Thank you for sharing.